From tomorrow's auction at Spink. I will buy a hat and eat it if this medal goes for the estimate. It is certainly a rather conservative estimate, notwithstanding, I dare say the missing KSA would rule it out for some collectors. Still an interesting recipient, I note he was convicted by Court Martial at Dronfield after the awful siege and "reduced to the ranks" as a direct result. djb wrote: From tomorrow's auction at Spink. I will buy a hat and eat it if this medal goes for the estimate. No need for a hat. 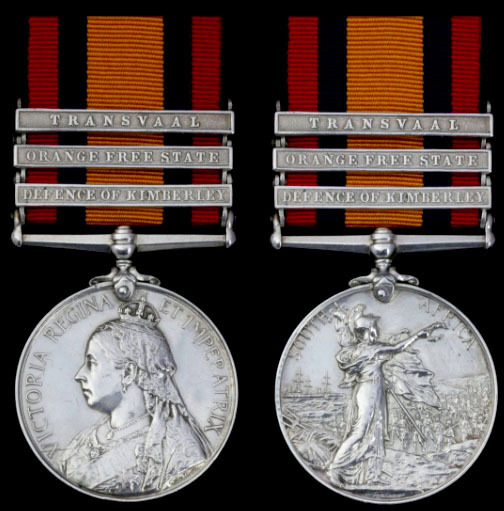 The QSA to Dyer just sold for a hammer price of £250. The QSA to Bolitho managed a hammer price of £1,700. No mention in the auction room of the incorrect listing. Presumably the purchaser knows it is not a Defence of Mafeking QSA? Sounds like the local millinery concerns are feeling a degree safer today! djb wrote: No need for a hat. The QSA to Dyer just sold for a hammer price of £250. The group to Greetham sold a few moments ago for a hammer price of £850.